Paranthropus robustus was originally discovered in Southern Africa in 1938. The development of P. robustus, namely in cranial features, seemed to be aimed in the direction of a 'heavy-chewing complex'. Because of the definitive traits that are associated with this robust line of australopithecine, anthropologist Robert Broom erected the genus Paranthropus and placed this species into it. Paranthropus robustus is generally dated to have lived between 2.0 and 1.2 million years ago. P. robustus had large sagittal crests, jaws, jaw muscles, and post-canine teeth that were adapted to serve in the dry environment that they lived in. The fossils include parts of a skull and teeth; all dated to 2 million years old. Fossil sites found of Paranthropus robustus are found in South Africa only in Kromdraai, Swartkrans, Drimolen, Gondolin and Coopers. In the cave at Swartkrans, the remains of 130 individuals were discovered. 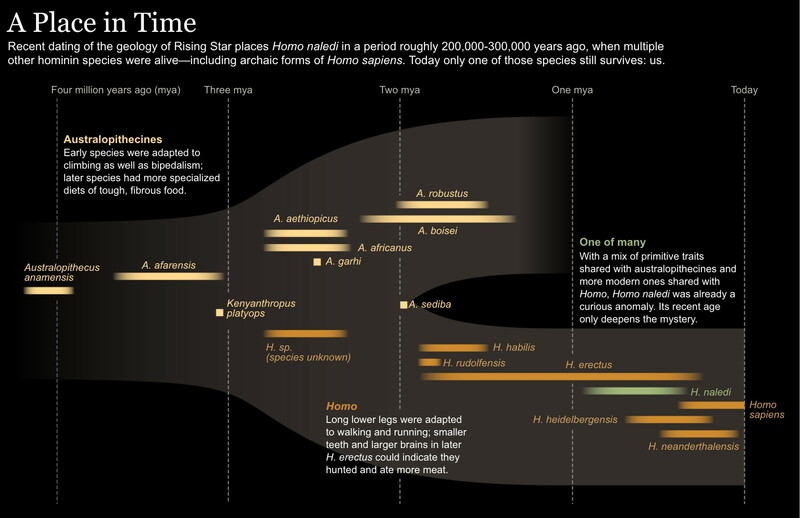 The study made on the dentition of the hominins revealed that the average P. robustus rarely lived past 17 years of age. The original complete skull (without mandible) of a 1.8 million years old Paranthropus robustus (SK-48 Swartkrans (26°00'S 27°45'E), Gauteng,), discovered in South Africa. Collection of the Transvaal Museum, Northern Flagship Institute, Pretoria South Africa. The species Australopithecus robustus was first discovered and named by the eminent Dr. Robert Broom. Broom made a habit of buying fossil remains from a lime quarry worker, and on a particular visit on June 8, 1938, Broom bought a maxillary fragment containing a first molar. 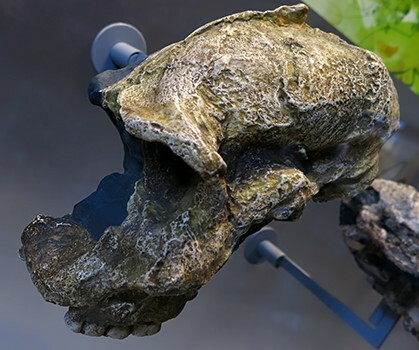 The shape and the size of the molar convinced Broom that this was a different species than Australopithecus africanus (Broom’s transvaalensis), and upon further investigation, found that the specimen had been found by a young boy who worked in the cave as a guide on Sundays. Broom searched for the boy (Gert Terblanche) and found him at school. Broom lectured the boy’s class on the cave sites of the area, and was then led to the place of the specimen’s discovery, Kromdraai. 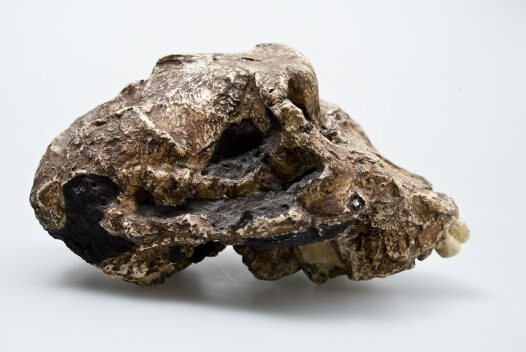 Broom found several more cranial and mandibular fragments associated with the original maxillary specimen, and this partial cranium (TM 1517) became the type specimen for Australopithecus robustus (see below). Broom spent some time working on a monograph of the australopithecines, which was published in 1946. This monograph included the description of TM 1517, and was a turning point for the South African australopithecines in the eyes of the world. Paranthropus robustus (or Australopithecus robustus) is an early hominin, originally discovered in Southern Africa in 1938. Particularly regarding cranial features, the development of Paranthropus robustus seemed to be in the direction of a 'heavy-chewing complex'. On account of the definitive traits associated with this 'robust' line of australopithecine, anthropologist Robert Broom established the genus Paranthropus and placed this species in it. 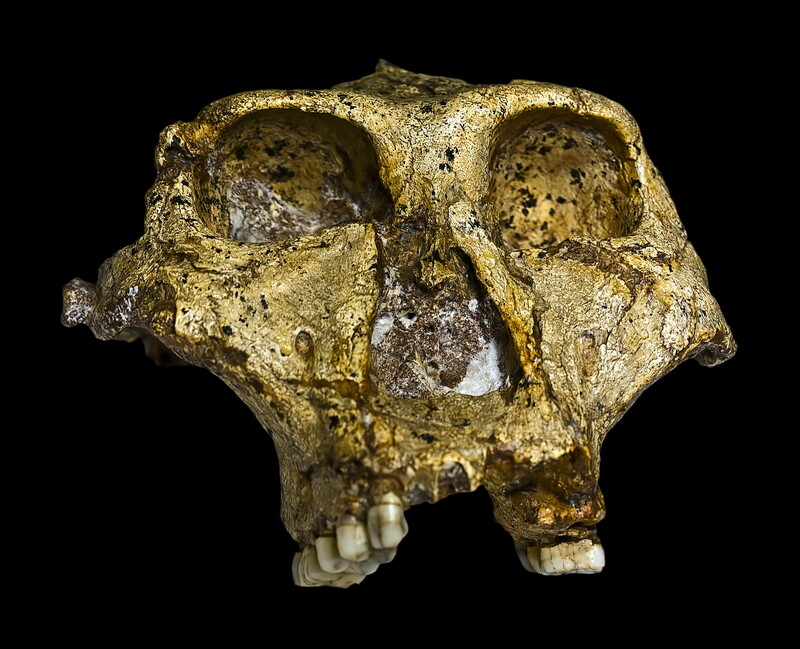 Paranthropus robustus is generally dated to have lived between 2.0 and 1.2 million years ago. It had large jaws and jaw muscles with the accompanying sagittal crest, and post-canine teeth that were adapted to serve in the dry environment they lived in. Permission: Creative Commons Attribution-Share Alike 4.0 International license. Not licensed for use on Facebook. Circa 2 000 000 BP. Circa 2 000 000 BP - 1 500 000 BP. 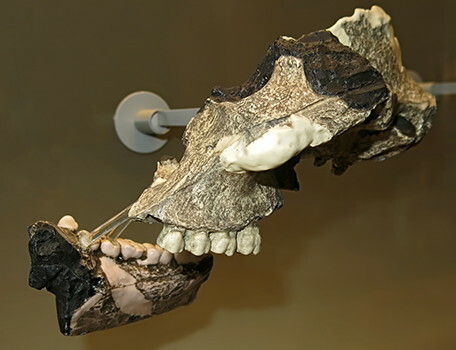 Cast of skull SK 48 discovered in 1950 in Swartkrans, South Africa. This adult skull has been dated between 1.5 and 2 million years old. Most of the skull minus the lower jaw is preserved, including the right canine tooth, right first premolar and all three left molars. After Raymond Dart’s discovery of Australopithecus africanus, Broom was in favour of Dart's claim that Australopithecus africanus was an ancestor of Homo sapiens. However, there was a great deal of skepticism and criticism from the academic community. Many claimed that Dart had been premature in naming the species, as the type specimen, called Taung Child, was a represented by a single skull of a juvenile. It was thought that such important claims should be based on a full skeleton of an adult. Robert Broom was a Scottish doctor then working in South Africa who began making his own excavations in Southern Africa to find more specimens of Australopithecus africanus, to help strengthen Dart's position. It was his intent to find complete adult skeletons that would justify the species designation of Australopithecus africanus, and further justify its place as an ancestor of modern humans. 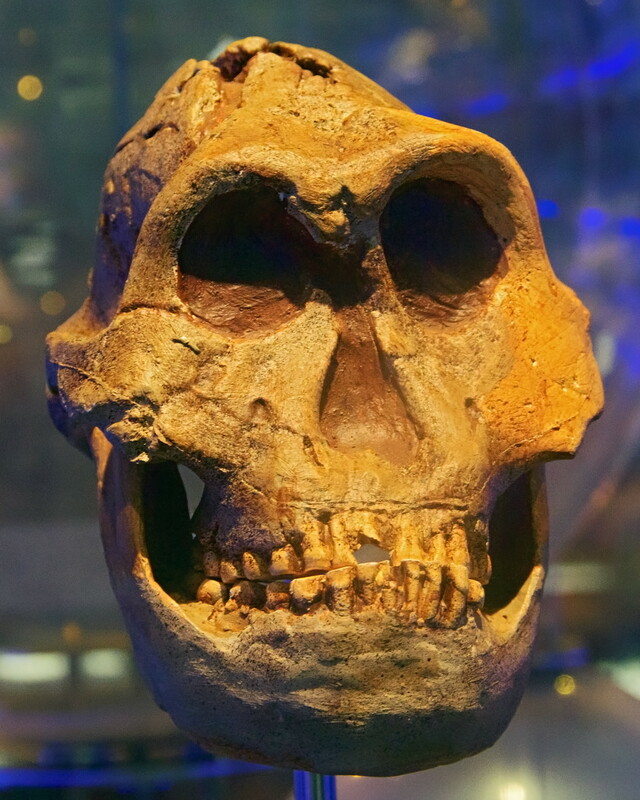 In 1938, at 70 years old, Broom was excavating at Kromdraai, South Africa and discovered pieces of a skull and teeth which resembled Dart's Australopithecus africanus find, but the skull had some 'robust' characteristics. The fossils included parts of a skull and teeth, all dated to 2 million years old. 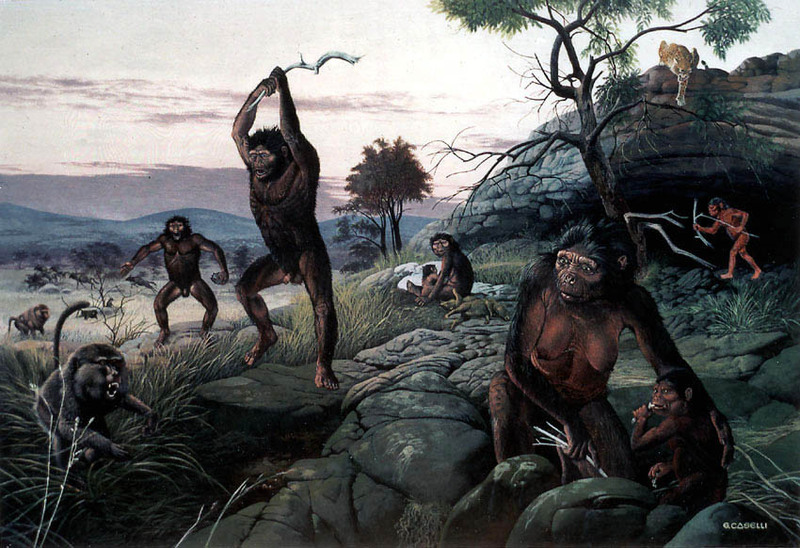 Sites with fossils of Paranthropus robustus are found only in South Africa, and include the sites of Kromdraai, Swartkrans, Drimolen, Gondolin and Coopers. In the cave at Swartkrans, the remains of 130 individuals were discovered. The study made on the dentition of the hominins revealed that the average Paranthropus robustus rarely lived past 17 years of age. Paranthropus robustus was the first discovery of a 'robust' species of hominin. It was found well before Paranthropus boisei and Paranthropus aethiopicus. These three species have alternately been in their own (Paranthropus) or placed within the genus Australopithecus. This is partly because in many small details, the species robustus resembles Australopithecus africanusmore than it does either of the other 'robust' species, aethiopicus or boisei. Broom's discovery was the second australopithecine after Australopithecus africanus. Paranthropus robustus skull, female, excavated 1994. Known as 'Eurydice', DNH-7, from the Sterkfontein caves.